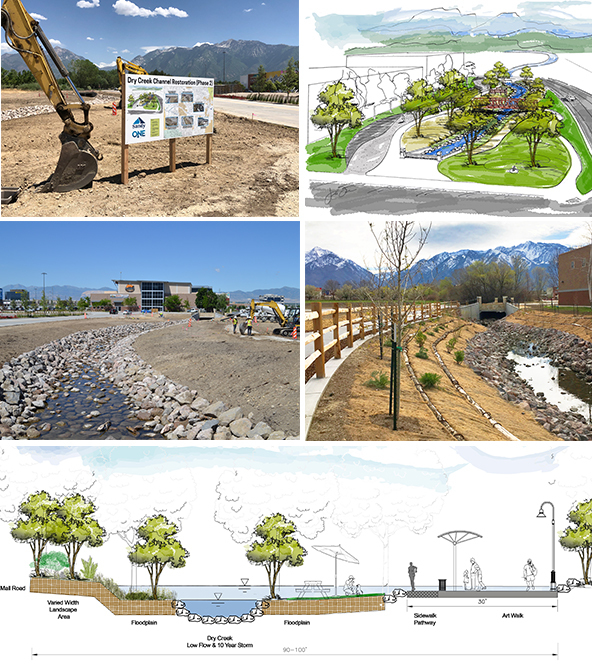 Bowen Collins & Associates (BC&A) completed the design, environmental permitting and construction management of 700 linear feet of the Dry Creek channel realignment near the Sandy City Mall to accommodate future development, the connection of Monroe Street and mitigate 100-year flood concerns. BC&A completed environmental compliance, including an extensive Individual Permit with the US Army Corps of Engineers, Salt Lake County Flood Control permitting and a State of Utah Stream Alteration permit. BC&A also designed and provided construction management for Phase 2 of the Dry Creek channel restoration further upstream between Monroe Street and Centennial Parkway to provide enhanced riparian habitat, a pedestrian trail, a pedestrian bridge, and a park for public use. Phase 2 will be complete in fall 2018.